Eddie Cotton is a talented song-and-dance man with a sassy sidekick, a crowd-pleasing act, and a promising future on Broadway. What he doesn’t have is someone to love. 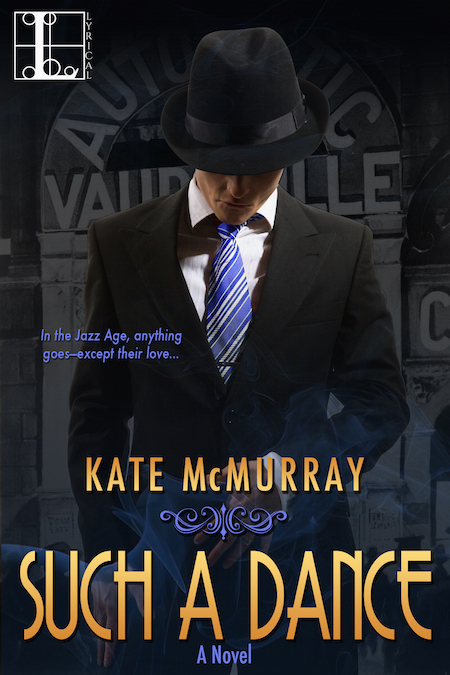 Being gay in an era of prohibition and police raids, Eddie doesn’t have many opportunities to meet men like himself—until he discovers a hot new jazz club for gentlemen of a certain bent…and sets eyes on the most seductive, and dangerous, man he’s ever seen. Lane Carillo is a handsome young Sicilian who looks like Valentino—and works for the Mob. He’s never hidden his sexuality from his boss, which is why he was chosen to run a private night club for men. When Lane spots Eddie at the bar, it’s lust at first sight. Soon, the unlikely pair are falling hard and fast—in love. But when their whirlwind romance starts raising eyebrows all across town, Lane and Eddie have to decide if their relationship is doomed…or something special worth fighting for. Order from Barnes & Noble. Want more information? Check out the Moonshine Monday archive for special features, background, and the real history behind the book. Eddie took a cautious step forward and was immediately pulled into a room full of hot air and cool tempers. Everything was draped in red velvet and blue fabric. Men around him danced and sang and cavorted. It was everything he expected and nothing like he could have anticipated. He pulled down the brim of his fedora, took a look around, and tried to get a handle on the situation. Did anyone recognize him? It didn’t seem so; his arrival was unheralded and no one so much as spared him a glance. Was there anyone he recognized? Not for certain. A few faces seemed vaguely familiar, like they might have been stagehands or people he worked with at the theater. No one whose name he could recall. Did anyone there catch his eye? Wasn’t that the bigger question? There was one man, sitting by himself at a table in the corner, smoking a cigarette. He seemed to be surveying the room as well. He occasionally put the cigarette in an ashtray and picked up a highball glass full of God knew what and took a slow sip. He was remarkably handsome, that was what Eddie noticed, with a shock of black hair on top of his head, dark eyes, and a shadow of stubble along his chin. He was athletic-looking, too; thin, but with broad shoulders. He had olive skin, like maybe he was Italian or Greek. He was a sheik, Eddie thought, like Valentino. Eddie found himself drawn to this stranger for reasons he couldn’t articulate beyond that he liked the man’s face, liked his masculine carriage, liked the way everything around him seemed to spell man—and he wanted to keep looking at that face for a while, wanted to see what the man’s hair would feel like under his fingers, wanted to know what it would be like to kiss and taste this man. Which of course was impossible. Or was it? There was not a single woman in this club. Eddie suspected that if he hadn’t known the password, he never would have been admitted. But this man was seated alone at a table. Maybe his date had gone to the men’s room. Maybe he was only there to look. The man looked up and made eye contact with Eddie. He crooked his finger. Come here, he beckoned. The man kicked out the other chair at his table. “Have a seat,” he said. “Hello,” said Eddie as he slowly sat. “You were looking at me.” The man picked the cigarette back up and took a long drag. The action drew a lot of attention to the man’s mouth, his thin but soft-looking lips, and Eddie couldn’t stop himself from continuing to look. He blinked. He couldn’t figure this man out. Was he dressing down Eddie? Did he really recognize him? Was he a mobster who would take offense at Eddie looking? “You’re nice to look at,” he said with no small measure of defiance in his voice.